Rooftop gardens are becoming increasingly popular and for good reason - they make efficient use of limited space in cities and help to create a more lush, verdant, and livable environment. The design options are diverse, depending primarily on the type of roof you have and your personal tastes. 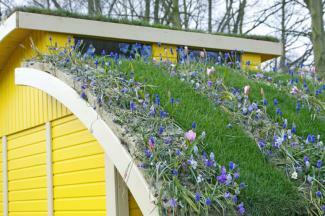 A living roof implies that the majority of the roof is covered with plants, typically drought-tolerant ground covers. Living roofs may be accessible in one area for viewing, but the idea is that they are mostly carpeted with plants and thus cannot be walked on. Sedums and other low-growing succulents are by far the most common plants used in living roofs, because they are require very little water and will grow in a tiny amount of soil. They also come in a multitude of colors, from cool blues to reddish earth tones. With the variety of low-growing succulent varieties and colors, it's possible to come up with a particular form and use different colored succulents to "paint" it onto the canopy of the roof. The possibilities are only limited by your imagination - parallel stripes, star shapes, a sunburst, undulating waves, zigzag patterns, polka dots, a smiley face, the peace symbol, the initials of a loved one, etc. Forego any identifiable pattern and do something totally abstract, mixing drifts of different species randomly. This gives a more naturalized look, as it mimics the patterns of vegetation found in the wild. You can still group each species into identifiable clumps, or you can mix them all together into patchwork quilt design. If you go beyond the low-growing succulents that are most commonly used and incorporate plants of varying heights and textures, it is possible to apply some of the typical design principles used for gardens on the ground. 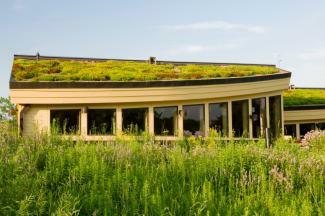 Drought-tolerant grasses are often incorporated on living roofs, which are taller and wispier than the tiny succulents, making them useful for contrast. Group them in bands of increasing height to create a backdrop behind smaller plants. There is no formula for how to do this, but it is generally best to use a relatively small number of larger plants in comparison to the smaller varieties, to create a scene that feels balanced. If your roof is designed for access and can bear the weight of people and large planters, it is a wonderful location for a patio garden. Rooftops are naturally windy places, so it makes sense to use hardy species to create a green enclosure to shelter both people and more sensitive plants. Large planters of bamboo are a quick and easy way to erect a wind-resistant hedge around the perimeter of a rooftop patio. Sun-loving, fast-growing drought tolerant shrubs, like wax myrtle, pittosporum or photinia could also be used. Finally, building a lattice structure and training vines to it has architectural appeal and provides the feeling of enclosure immediately. The lattice could also be used overhead for shade protection. 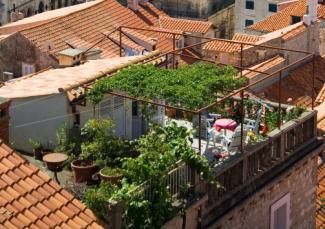 Every rooftop garden is essentially a container garden, as this is the only way to provide soil. The extensive carpets of vegetation described above can be achieved by laying down a waterproof membrane and covering it with several inches of lightweight potting mix and using 2x4s to create a low border to hold the soil in place. In this way, low-growing lawn-like plantings can become part of the container garden. For most shrubs and perennials, an arrangement of rectangular wooden planters is a good choice. These can range from 6 inches to 24 inches deep depending on what will be grown in them. For annual flowers use window planters mounted to any available vertical surfaces and hanging baskets supported by any overhead structures, such as a lattice pergola. Small trees can be accommodated in large tubs and planters that are at least 24 inches tall, wide and deep. It's nice if these are circular, square or hexagonal in shape, to create a focal point for the tree in contrast to any elongated rectangular planters. Place the trees in natural focal points, like the corners of the roof. Having these large planters on casters is a good idea, so they can be easily moved. A chimenea style fire pit, barbecue, water feature, outdoor table and comfortable chairs are all options to make a rooftop garden a place to relax. Shade is critical for daytime to use, so consider an awning structure or a vine-covered wooden pergola to cover a portion of the garden. A pergola, planters, bench and table can be designed and built as one integrated structure to give a sense of unity among the different design elements. As long as you can provide some shelter from the intense winds that are typical of rooftop gardens, there is no reason they can't become an edible oasis. Herbs are a great fit for the small pots and planters that can populate any available windowsill, ledge, table or railing. Some of the ground cover herbs - thyme, oregano and mint, for example - are also candidates for the large scale plantings discussed in the living roof section. 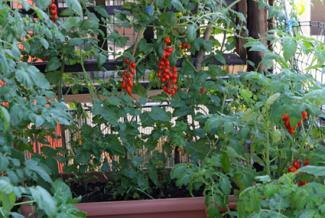 A planter at least 10 inches deep, but ideally 18 inches deep, is necessary for growing vegetables on a rooftop. Most vegetables perform poorly in windy conditions, so try to give them the most sheltered location possible, such as against an existing wall or on the leeward side a thick bamboo hedge. It's a good idea to observe the direction of the prevailing winds before planning the location of a bed of annual vegetables on top of your roof. Fruiting shrubs are a poor choice as a rooftop windbreak, but they are potential candidates for planters in sheltered locations - blueberries, blackberries and raspberries all grow well in 15-gallon or larger size containers. Dwarf fruit trees are an option to use as focal points in large tubs and planters. Figs are one of the top choices, as they are very wind resistant and produce abundantly with their roots confined in a container. There are also many dwarf citrus varieties that grow to only 5 or 6 feet tall and are adaptable to rooftop containers, as long as they are not subject to heavy winds. Besides being a charming venue for a patio garden, adding vegetation to the roof helps to keep the house cool in summer, lowering energy bills and helping to conserve resources. Vegetating the entire roof also soaks up a lot of rainfall, meaning it doesn't all wash into the nearest storm drain and contribute to flooding and erosion downstream. 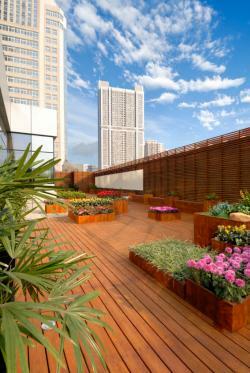 At the very least, rooftop gardens are yet another way to bring the beauty of plants into your life.